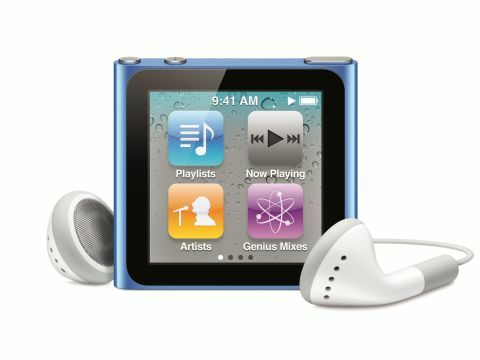 Though it's lost a few features and gained a few pounds, it's hard to fault what's there in the new iPod nano. Somebody at Apple obviously hates the phrase "If it ain't broke, don't fix it" because it has completely redesigned its best-selling iPod, the iPod nano, yet again. This year's model is half the height of the previous generation and has the same clip-on design as the new iPod shuffle. The big change is that there's no click wheel, just a screen. In fact, the only physical buttons found on the device are for sleep/wake and adjusting volume. Everything else is controlled by a brand new multi-touch display. But don't mistake the nano for a scaled down iPod touch; the nano appears to run some version of iOS, Apple's iPhone, iPod touch and iPad operating system, but its a unique severely restricted version compared to the full fat iOS 4 found on the touch. You can't buy and install third party apps, for example, and there are far fewer applications, and no Wi-Fi. In Apple's iPod line up, the new nano still sits squarely in-between the simplistic iPod shuffle and the all-singing, all-dancing iPod touch,with the traditional iPod classic now marginalised as a device reserved for people who need a lot of storage. Historically the nano has always represented a good balance between price and features, but this time around we were surprised to find that the UK price has actually risen by quite a bit, with the 16GB version at £159 (up from £138) and the 8GB version at £129 (up from £118). What's even more surprising is that the ability to play or create videos (one of last year's nano's most touted features) has been removed altogether, making the new nano an audio-only device. But before we tackle that thorny issue, let's take a look at the intriguing new multi-touch display.